I Left My Prostate in San Francisco-Where's Yours? After receiving his Master’s in Social Work from Michigan State University, Rick Redner spent two years as a Medical Social Worker. From there, he decided to become an entrepreneur, owning and operating two sandwich shops for the past 30 years. Also a Michigan State University graduate, Brenda Redner obtained her RN/BSN. She has experience in oncology, home health care, psychiatric nursing and teaching. She went on to home school their four children. 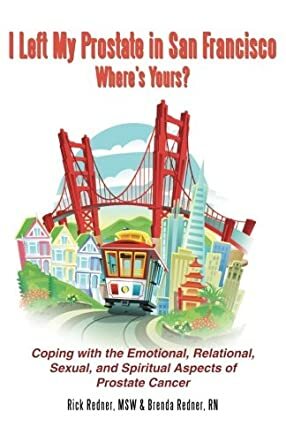 At the writing of the book "I Left My Prostate in San Francisco– Where Is Yours? : Coping with the Emotional, Relational, Sexual, and Spiritual Aspects of Prostate Cancer" by Rick Redner and Brenda Redner, the American Cancer Society reported that 241,740 men would be diagnosed with prostate cancer in the US. Yet men do not want to discuss prostate cancer. Courageously, Rick and Brenda Redner share their knowledge, experiences and feelings with readers in the hope that they can help someone else facing the same situation. On December 10, 2011, Rick Redner received a phone call from his Urologist with the results of his biopsy---positive. Rick had prostate cancer and it was considered moderately aggressive. He pictured tiny monster cells in his body chewing their way through his prostate. He was frightened; his mind was filled with questions and he was filling in his own answers without being informed. “I Left My Heart in San Francisco” takes the reader on a treacherous journey from the moment the Urologist found the lump. Too often doctors gloss over the side effects of treatments. Rick and Brenda share in an honest and open manner. This book demonstrates that prostate cancer affects the whole family, not just the patient and not just physically but emotionally and spiritually. I had never received a book dealing with prostate cancer until last week, but then I received three books on the subject. They came in at a time when I needed them. My husband had just received the news that his PSA level was 9.5. We both knew what that could mean and naturally it frightened us both. I’d like to thank the Redners for writing this book. The Redners write in a simple, easy to read manner. The information within these pages is invaluable. There is information concerning biopsies, surgery, leakage, erectile problems and diapers. They also discuss the depression a male faces after surgery. This book should be in every library and should be recommended by all urologists. This book is not just for men but for wives also. Again I thank the authors for their openness.